At Enterpack we pride ourselves on understanding our customers' needs in order to provide effective and efficient solutions. Whether you are a ready meal producer or a high street butcher, when it comes to food distribution nothing is more important than the preservation of aroma and flavour while maintaining a perfect presentation. Enterpack has a comprehensive range of trays and film offering many opportunities for your business. The Enterpack machines have been designed with ease of use in mind, they are user friendly, compact and very reliable. We have a range of heat resistant trays that can be frozen and then reheated in either a microwave or conventional oven. Our heat seal films are leak proof, ensuring trouble free transportation. Think of Enterpack, as your business partner, contributing and strengthening your business position. Here at Enterpack, we are committed to getting the right combination of machine, tray and sealing film for our customers. What is important to us, is that our trays protect and enhance your product, allowing you to maximise your sales and grow your business. We offer a range of economical manual machines, high speed automatic machines and for our more industrial producers an inline machine with the capability of modifying the atmosphere to give enhanced shelf life and presentation. Enterpack works with you every step of the way, from free initial advice and tray samples, to delivery, installation and staff training. We don't like unexpected extras so all our prices include samples, demonstration, delivery, installation, commissioning and health and safety training. If you have staff changes, we will come back and re-train free of charge. 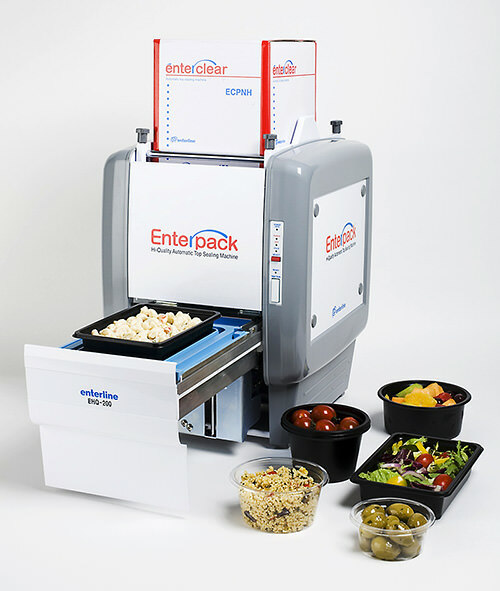 Enterpack are a specialist supplier of professional grade heat sealing machines for fresh food. Our machines are the most advanced in the industry, available in both manual and automatic models. 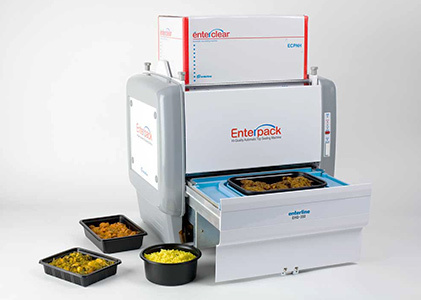 At Enterpack we offer some of the easiest to operate food tray sealing machines in the industry. Enterpack automatic food packaging machines are the easiest to use heat sealer in the industry; simply pop in a tray and the machine does the rest. Our machines are incredibly quiet and compact too; meaning they are perfect for use directly at the sales point. Enterpack machines support over 400 different tray sizes, flexible thanks to their modular heater set system. A single machine can be fitted with a variety of different heater sets to accommodate a wide variety of different size, shape and material trays. The product of years of research and development; Enterpack food sealing machines are custom built to offer the best seal possible. Our heat sealers tooling has been carefully designed to ensure no heat is applied to the food being sealed and our machines accurately profile cut the film around the tray resulting in a professional, neat finish. Enterpack tray sealers are loaded with a box of film into the top of the machine, making it quick and easy to replenish it. Some of our machines can even punch a tiny micro-perforation into the film, helping to ventilate hot products or remove natural gases emitted from red meat, keeping the meat fresher and full of colour for longer.